At last – clothes for me! 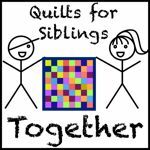 I think this is the last of my posts for the first quarter finish along; as you can see I’ve been on a bit of a sewing mission. At the beginning of the year I made a Fen Dress out of knit fabric. I spend a lot of time thinking about making clothes for myself, researching patterns, trying to work out what suits me and finding suitable fabrics. I think it was Kerry who suggested the Fen Dress and after reading a number of reviews I decided it was worth a try. I bought the PDF version on sale from Indiesew on Black Friday and I made a dress out of some leftover red jersey fabric. 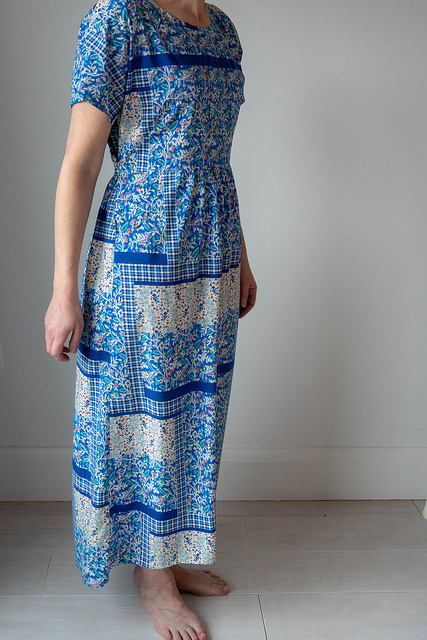 It is recommended that the dress is made from a woven fabric so I cut in a size smaller than I normally would (6 on top and 8 on the bottom) and also added 2 inches to the length, and added the optional sleeves. I don’t have any photos of the finished dress so you’ll just have to believe me that it’s a really comfy dress; I’ve worn it numerous times. I decided last month that it was time to try a few variations. 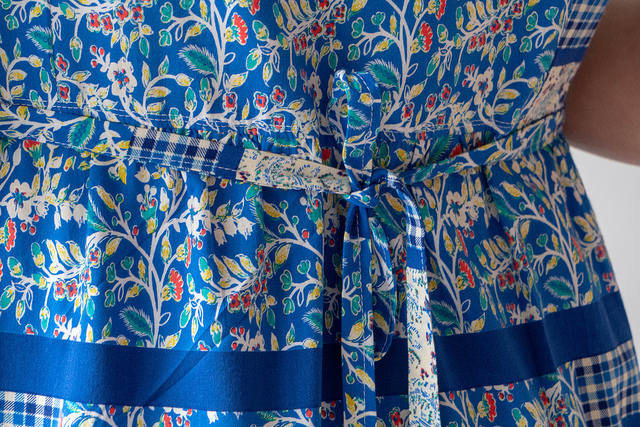 I bought this fabric from Miss Matatabi, it was in the sale and even with shipping pretty cheap. 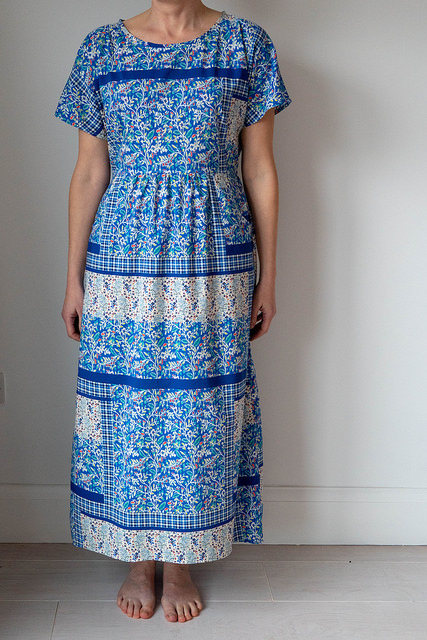 It’s 55% cotton 45% rayon lawn and lightweight, just right for a summer dress. We have booked a holiday to Italy this summer so I wanted to make a couple of things to wear that would be suitable for hot weather. I added 15 inches to the length of the original pattern and omitted the sleeves. 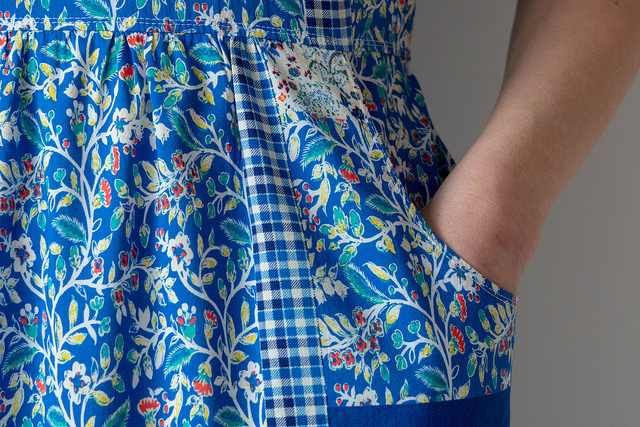 One of the great things about this pattern is of course the pockets! If you were making this in a solid you could easily use a contrasting colour for the pocket back piece to add a fun detail. As it’s still pretty cool here I’ve yet to wear this but I am pleased with how it turned out and am already contemplating another. This was on my FAL list for quarter 1 so I’m off to link up and check out what others have achieved this quarter. What a great summer dress, I hope you get to wear it lots and lots over the coming months! On behalf of the hosts thank you for joining in the Finish-A-Long!